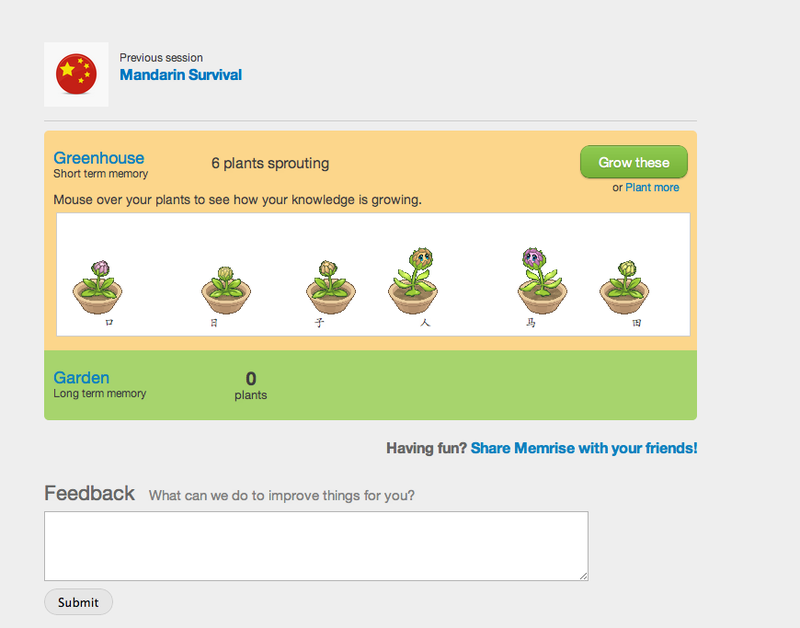 Crowd-Sourced Learning Platform Memrise Nabs $1.05M From Matt Mullenweg, Lerer Ventures And More! Memrise, an online community that attempts to teach people languages through crowdsourcing, is announcing its $1.1 million in seed financing today, from Matt Mullenweg’s Audrey Capital, Avalon Ventures, Balderton Capital, Lerer Ventures, Zynga Boston head Nabeel Hyatt, former Facebook data head Jeff Hammerbacher, Bill Warner, Scott Heller, Walt Winshall and Ken Baumann. Memrise incorporates a unique way of teaching and teaching foreign words; It crowdsources Mems, or Mneumonic devices from its community and then imparts them to users through online lessons involving animated gifs (below). The startup uses a gardening metaphor to represent a student’s journey — each Mem you learn is a plant, your total sum knowledge is a garden, etc. I’m still sort of doubtful that any online education model works, but right now I have six Mandarin “plants” sprouting, which is a lot more Mandarin than I knew before Memrise. Founder Ed Cooke swears by this five minutes a day of Mandarin, and has kept bugging me about how I should continue my Chinese language learning after this post. I’ll let you know how it goes. Founded by Cooke, who happens to be US memory grandmaster, and Greg Detre, a Princeton Neuroscience PhD, the community attempts to position itself against pre-existing online education properties like Kahn Academy by its novel crowdsourcing model and testing process. “We believe that learning and testing should not be separated but that both, are, forms of learning when done right,” Cooke tells me. Right now the service is focused on teaching Mandarin, French, Spanish and Italian, but Cooke says that SAT vocabulary will be coming in the next twelve months in addition to “phrase” learning instead of just words. Mobile apps and more languages are also in the pipeline.